This is the third and final post in a series I’m writing about coworking spaces and how to start them. 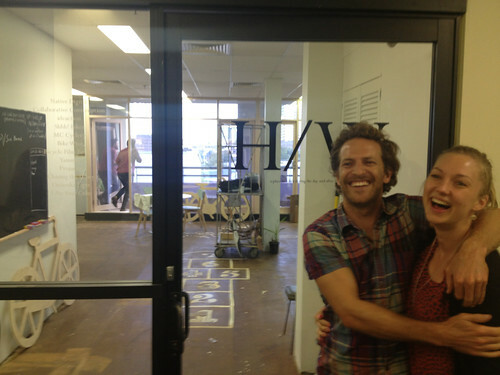 Here’s the first piece on Inspire9 and the second piece about Hub Melbourne. Home/Work is the new coworking space in Sydney on Oxford St where I have been basing myself for the last month. I’ve already written a post about Home/Work, back in it’s first week so I encourage you to check that for more information about the space and where it’s located. I’d like the focus of this post to be how Josh, the founder, went about starting the coworking space and how he managed to go from a completely empty space to one that’s almost over-subcribed in 2 weeks. The secret to this success is, I believe, in the way Josh launched the space and kept things small as he started up. In this way, it’s similar to how Inspire9 opened up in Dover St before their move into the bigger space in Stewart St.
My first contact with Josh actually came through twitter and this blog and the post I wrote about working at home. Lauren, Joshs’s partner in crime, tweeted or emailed me and said that he might have something in the works for the new year. I replied that I was very interested. Sure enough, come early January Josh emailed me and said he’s managed to secure a space in the old Oxford Street offices and was creating a coworking space in it. I was very excited. The email was a group email, I assume probably to a group of about 30-40 people. But they were all very close contacts of Josh’s – people he’s worked with or collaborated with before. And if you know Josh, you know that he’s a very lovable and enjoyable fellow to be around. His email would have been well received. I shot him back an email saying I was in. One week later, I was in the space working for the first time. Josh worked around the clock with his own special DIY abilities to get Home/Work ready for people to work productively from. He borrowed wifi from a neighbor for the first week or two, built desks out of scrap wood and fashioned a meeting room table from a disowned door. He had help creating funky typography on the floor of the space, to give it a playful feel and then painted a blackboard onto the wall. He even has the Mayor, Clover Moore, in! Job done! After the second week, it was already apparent that the space was full and there were no more desks available. You can still drop in for a few hours at a time or maybe a day if you time it right and Josh is happy to keep it fairly basic in terms of pricing. If you’re going to be around for a few hours, then you can drop by but if you’re making a habit of it then you’ll need to pay. For the early crew involved, these guidelines are pretty self-evident and observed pretty well. This has made it easy for people flying up from Melbourne to drop into as well as other friends of Home/Work members to drop in for a bit of working time. This is what Home/Work has done very well. The concept hasn’t been over thought. There are desks and there are people. That’s about all you need. Josh is slowly filling out the space with the more useful amenities like a microwave, wifi and spare keys but all of those have only been sourced as there has been a need. It’s a lean operation, and so it gives Josh time to work as a consultant whilst still operating the coworking space. All this has led to an enjoyable place to work where everyone has a growing level of ownership and comfort. 1: Didn’t over complicate things and just invited people to come via a direct email. 2: Worked quickly to allow people to come into the space. They haven’t lost time worrying about things that don’t matter (yet). 3: Has an open vibe too, with a fairly simple payment philosophy. That is, ask Josh. 4: Didn’t get too caught up with the community activities that are possible in a coworking space. Home/Work provides the basic foundations for what coworkers are looking for – A desk and some room to work, every day. First up: These wraps are great and very informative to both coworkers and folks like me setting them up. Unless we ask for feedback or it happens on the fly, reviews like this I imagine are rare – so thanks and well done. Couldn’t agree more on the ‘space everywhere’ idea. In fact, this post was written on the communal table at the Palace Verona Cinema in Paddington. I enjoy the anonymity of places like that. Airports are similar havens for me. Enjoy your trip!